Our eBooks can be read on Amazon's line of Kindle readers, including both the Kindle Fire and the eInk versions (Kindle, Kindle Touch, Kindle Keyboard, and Kindle DX). Many of the eBooks on our website are available in MOBI, a native Kindle format. If you prefer the watermarked PDF version of an eBook, you can also read them on most Kindles. Since the MOBI format is Kindle native, you can change font options (including size), make notes, and highlight text. PDFs, however, are faithful representations of the print book. Therefore you cannot adjust the font sizes or make notes when reading PDFs on a Kindle. You can easily transfer a MOBI or watermarked PDF to your Kindle via USB. You'll learn how to do this in the "Transferring the eBook to Your Kindle via USB" section below. Using Amazon's Kindle Personal Documents Service, you can email either MOBI or PDF files to your Kindle (some fees many apply). You'll learn how to do this in the "Using the Kindle Personal Documents Service" section below. 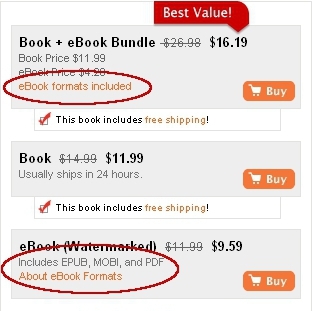 This guide will assist you in loading your eBooks to your Kindle using both of the above methods after purchase. Once on your Account page, all of the available formats for your purchased eBooks will be displayed as links. Click on the link of the appropriate format (either MOBI or PDF) to download the eBook to your computer. 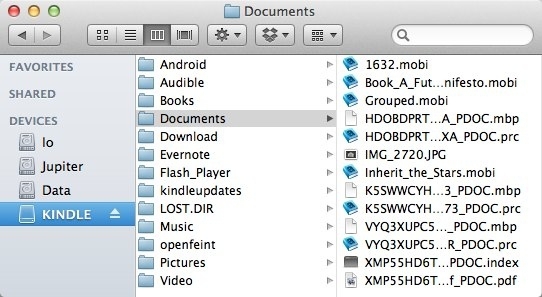 Be sure to remember where you save the file -- you'll need it when transferring the eBook to your Kindle. Your Kindle enters into USB Drive mode. 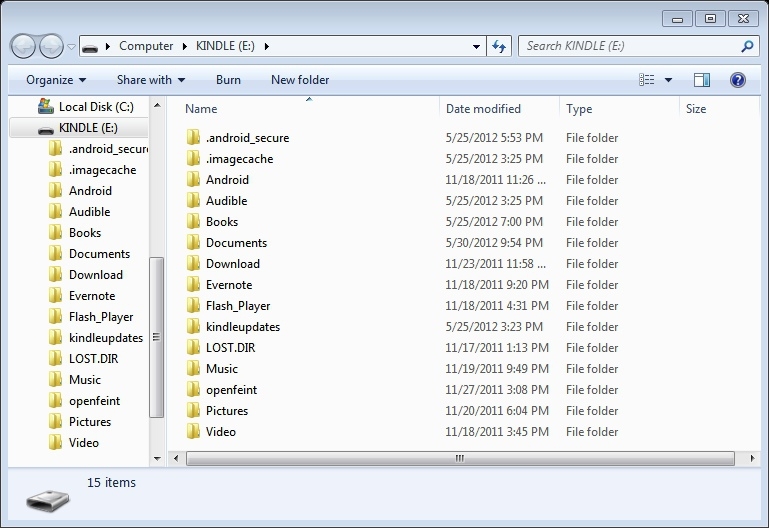 A drive labeled "KINDLE" will appear on your computer (On Windows it'll be in "My Computer," and on OS X it appears on the Desktop). Transferring an eBook to your Kindle via USB saves the file directly to that particular device. If you have multiple Kindles, or use the Kindle app on your smartphone or tablet computer in addition to a physical Kindle, eBooks transferred via USB will not be available across all of your Kindles without repeating the transfer process for each device. Amazon's Kindle Personal Documents Service allows you to email an eBook to your Kindle, making it available to all of your Kindles. Any file sent to your Kindle using this service will also sync your current location, notes, and highlights across Kindles. Amazon offers this service for free only when the personal documents are delivered to your device via WiFi. If you have an eInk Kindle that uses Amazon's Whispernet 3G service and is not connected to a WiFi network, you might be charged for the document delivery. See this page on Amazon's website for the list of fees. First you have to authorize an email address from which your Kindle can receive documents. Go to the Personal Document Settings section of the Manage Your Kindle page on Amazon's website to set an Approved Personal Document e-mail address (consult Amazon's documentation for the exact directions). Create an email message from your authorized email address and attach the MOBI or PDF file files that you downloaded in the "Purchasing and Downloading an eBook" section above.